Today’s Business Live radio show, broadcast live this morning on FM radio via Sheffield Live and available to stream or download as a podcast below featured guests Amanda and Simon Cookson of Northern Value Creators and Jay Bhayani of Bhayani HR and Employment Law. Amanda, Simon and their business Northern Value Creators, “canny folk who develop people and grow relationships” – what they do, why and how. tips and advice for anyone in a business partnership with their partner in life, too. Many leaders understand the value of relationship (rather than transactional) approaches to business, of transparency, of clarity in articulating their purpose and mission. But they can struggle to implement this. Why, and what should they do? Comments on skills and talent (which are different) in the creative and digital industries. Key updates in employment legislation from returning guest Jay Bhayani. New requirements for employers around payslips and contracts. Brexit preparedness and contingency planning around the right-to-work in the UK for your migrant workers. 0 – 3:47 introduction and updates including new data about visitor numbers and spending in Sheffield City Centre; analysis on behalf of Social Enterprise UK has found the number of social enterprises winning public sector contracts has fallen to its lowest level for two years. 52:30 – 53:01 wrapping up. 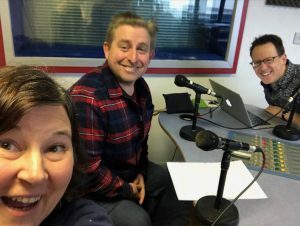 The Business Live radio show is broadcast live every Friday on Sheffield Live radio – and available as a podcast in iTunes here. Twitter for Amanda and Simon and the website for their business, Northern Value Creators. Jay Bhayani’s firm, Bhayani HR and Employment Law.